Cosmic Mates was made to easily calculate your numerology chart and run compatibility evaluations on your relationships. She has been a practitioner of numerology for over thirty-five years, and is frequently called upon by national and international media as an expert in the field of numerology. 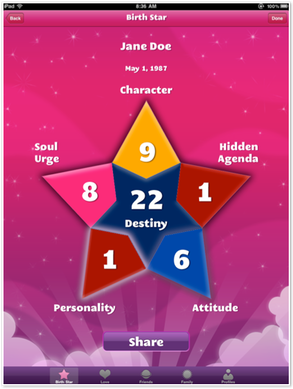 You will receive a graphical rendering of your numerology chart in the form of a star. Each segment of the star represents an aspect of you. The numbers assigned to each area are based on your name at birth and your birth date. Tap on a star segment to reveal a full explanation about that aspect and the number that corresponds with it. The object of your affection: is it meant to be? Your relationship is assigned a certain level of compatibility based on your birth star and that of the person with whom you are paired. A rating of Level Eight is the rating of highest compatibility.